Ferdinand Hodler (1853–1918), Lake Geneva with Mont Blanc in the Morning Light (1918), oil on canvas, 65 x 91,5 cm, Kunsthaus Zürich, Zürich, Switzerland. Wikimedia Commons. The war years were hard for Ferdinand Hodler. Ostracised by former friends and colleagues in Germany, after he criticised the bombardment of Reims, he travelled little outside Switzerland. His lover Valentine Godé-Darel was wasting away in front of his eyes, dying of cancer. But Hodler’s art continued to progress towards his vision of unity and harmony, and in these final years he painted some of the most sublime landscape works of the century. Although some accounts portray Hodler’s last few years as being racked by illness and filled with depression, he actually seems to have weathered the challenges well, and far from his output or quality declining, his late works are among his best. Ferdinand Hodler (1853–1918), Valentine Godé-Darel One Day Before Her Death (1915), oil on canvas, dimensions not known, Kunstmuseum Basel, Basel, Switzerland. Wikimedia Commons. 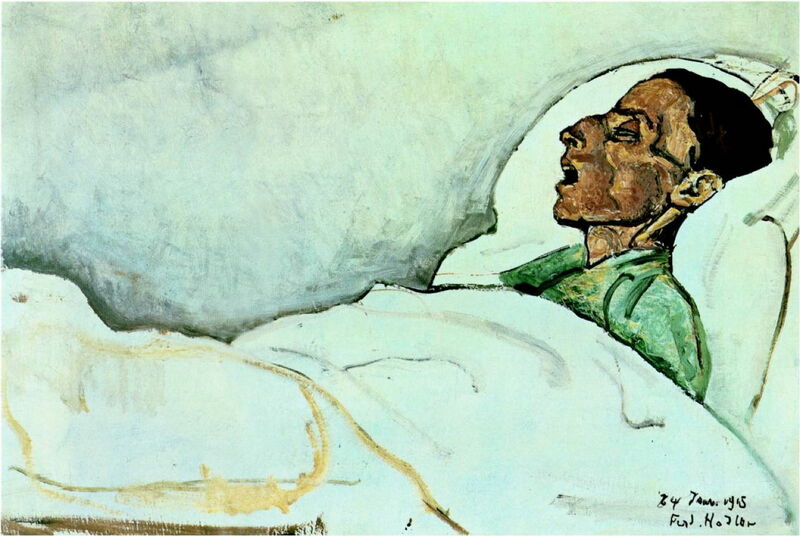 He documented the relentless decline in his lover’s health in a series of more than twenty harrowing paintings made in her home in Vevey, at the eastern end of the north shore of Lake Geneva, including this, of Valentine Godé-Darel One Day Before Her Death (1915). She finally died in January 1915. Hodler then started to teach drawing at the École des Beaux-Arts in Geneva, which he continued until the middle of the following year. 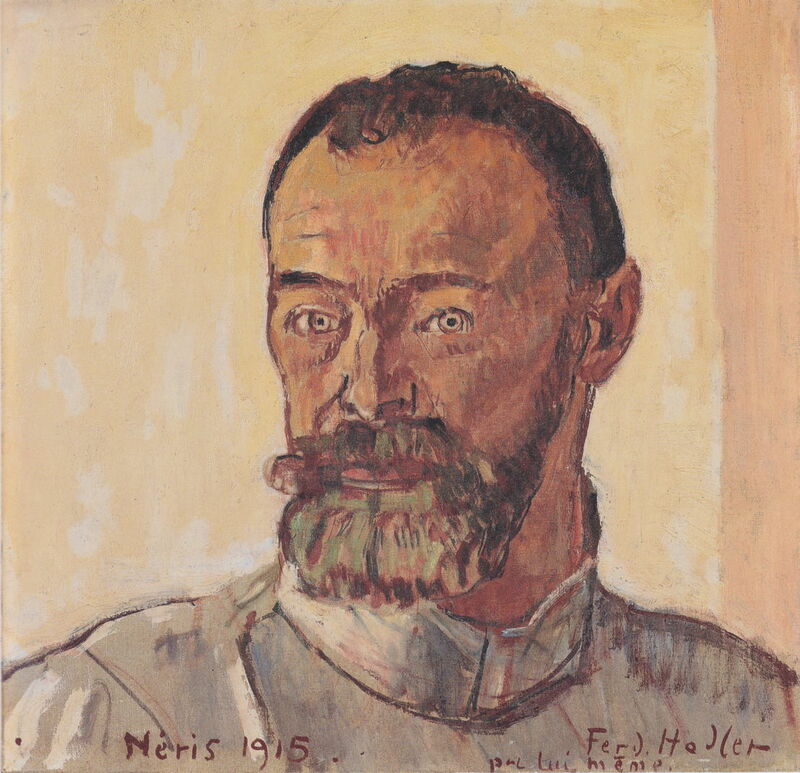 Ferdinand Hodler (1853–1918), Self-portrait at Néris (1915), oil on canvas, 39 × 40.5 cm, Stiftung für Kunst, Kultur und Geschichte, Winterthur, Switzerland. Wikimedia Commons. In the summer of 1915, Hodler suffered from shortness of breath, and travelled to recuperate in the central French spa town of Néris-les-Bains. While there, he painted this Self-portrait at Néris (1915). It was to be the last time that he ventured outside Switzerland, and the first of a series of late self-portraits. 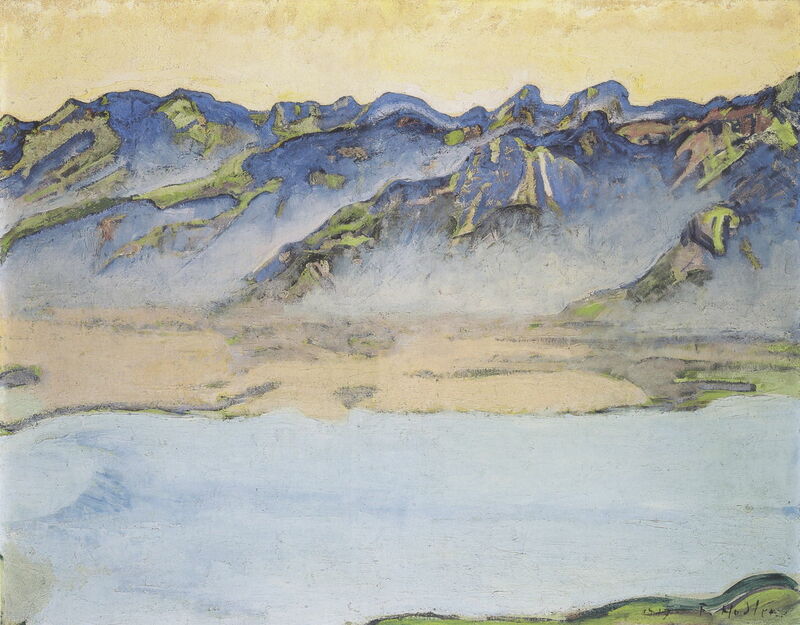 Ferdinand Hodler (1853–1918), Landscape of the Swiss Alps (date not known), oil on canvas, 52.5 × 72.5 cm, Israel Museum מוזיאון ישראל, Jerusalem, Israel. Wikimedia Commons. This undated Landscape of the Swiss Alps was probably painted before the First World War, but serves as a good reminder of the rhythm and symmetry which had come to dominate recent landscapes. 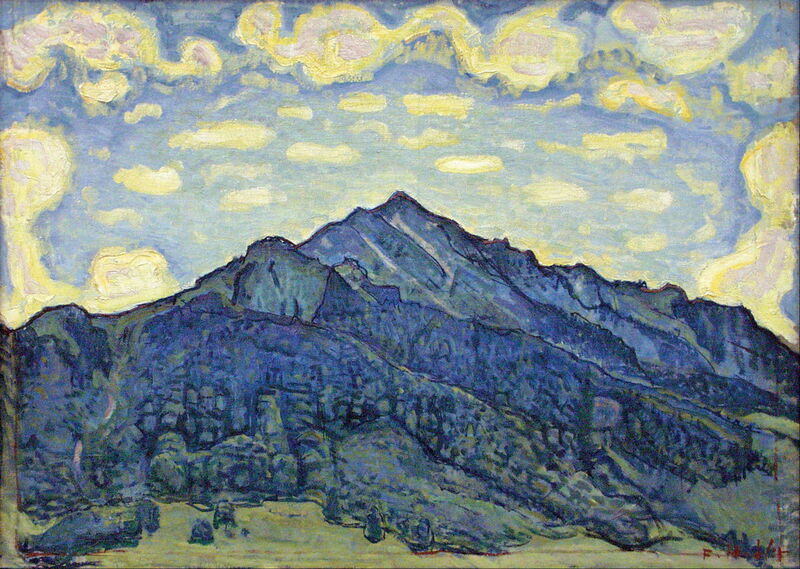 Ferdinand Hodler (1853–1918), Summit in the Morning (c 1915), oil on canvas, 51 x 81 cm, Kunsthaus Zürich, Zürich, Switzerland. Wikimedia Commons. Now, in about 1915, he emphasised simplicity in his views of the Alpine peaks and ridges. 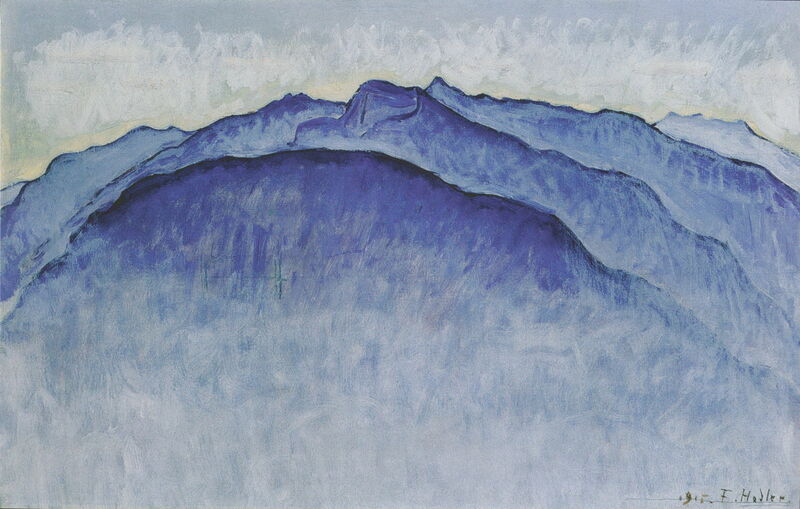 His Summit in the Morning, from about 1915, demonstrates well how he discarded what he saw as unnecessary detail, to capture just the salient forms and colours. Ferdinand Hodler (1853–1918), Mountain Stream Near Champéry (1916), oil on canvas, 82 x 98 cm, Kunstmuseum Winterthur, Winterthur, Switzerland. Wikimedia Commons. He seems to have spent at least part of the summer of 1915 at Champéry, a village on the border of Switzerland and France, close to the spectacular ridges of the Dents du Midi and Dents Blanches. Mountain Stream Near Champéry (1916) appears to have been a more conventional painting made in front of the motif. He seemed generally optimistic about his art and life, and in fair health, at the time. He wrote with characteristic modesty “I am starting to get a better grasp of the Alpine landscapes”, which must be the understatement of his career. Ferdinand Hodler (1853–1918), The Dents Blanches (1916), oil on canvas, 69.5 × 87.5 cm, location not known. Wikimedia Commons. 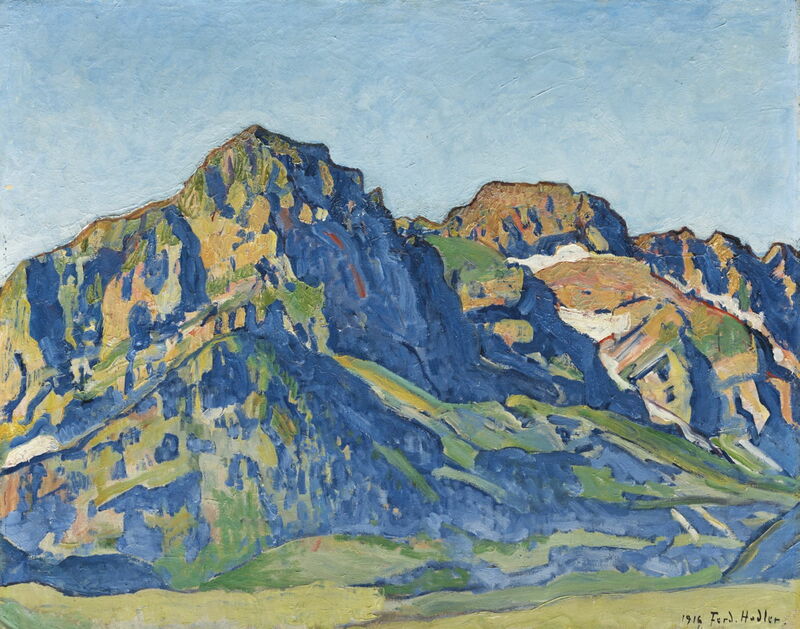 Hodler painted his more detailed and less simplified view of the ridge of The Dents Blanches in 1916, presumably during his time at Champéry, Switzerland. Easily mistaken for a watercolour, the optical effect in Hodler’s Rising Fog Over the Savoy Alps, painted in the summer of 1917, heralds his change to extreme simplification, as the valley mist obliterates detail. During that summer, Hodler had his largest one-man exhibition to date, with more than 600 works on display at the Kunsthaus Zürich. He wrote that he considered that he was finally getting closer to what he termed the “great unity” in his paintings – his aim of unity and harmony in his art, including, in his figurative work, the harmonies of mankind. Ferdinand Hodler (1853–1918), The Grammont in the Morning Sun (1917), oil on canvas, 64 x 90.5 cm, Private collection. Wikimedia Commons. Another fine landscape from the summer of 1917 was The Grammont in the Morning Sun. This shows one of the highest peaks overlooking Lake Geneva on its southern shore, which rises to a summit of 2,172 metres (7,126 feet). During the winter of 1917-18, Hodler’s health worsened considerably, but he continued to paint landscapes from the window of his room in Geneva, completing more than eighteen during these final months. Here I show three as examples. Ferdinand Hodler (1853–1918), Lake Geneva with Mont Blanc by Morning Light (1918), oil on canvas, 59 × 119.5 cm, Private collection. Wikimedia Commons. 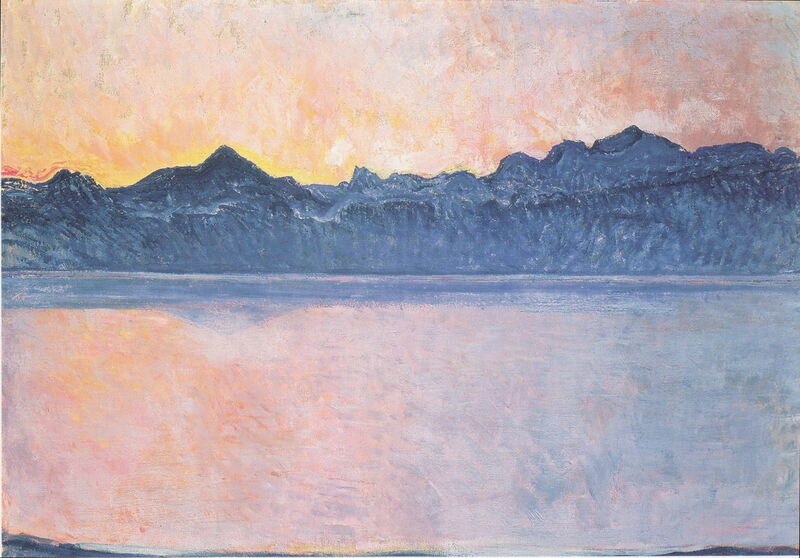 In Lake Geneva with Mont Blanc by Morning Light (1918), one of the more complex paintings of this series, bands represent the lake shore, four different zones of the surface of the lake, the lowlands of the opposite bank, the mountain chains, and two zones of colour in the dawn sky. The lower section of the sky and the foreground shore echo in colour, and contrast in their pale lemon-orange with the blues of the other bands. Lake Geneva with Mont Blanc in the Morning Light (1918) has a much simpler structure, with the water, a band of reflections, the mass of the far shore and mountains merged, and the dawn sky. The dominant colour is the yellow to pale red of the dawn sky and its reflection. Ferdinand Hodler (1853–1918), Lake Geneva with Mont Blanc in the (Red) Dawn Light (1918), oil on canvas, 74.5 x 150 cm, Private collection. Wikimedia Commons. 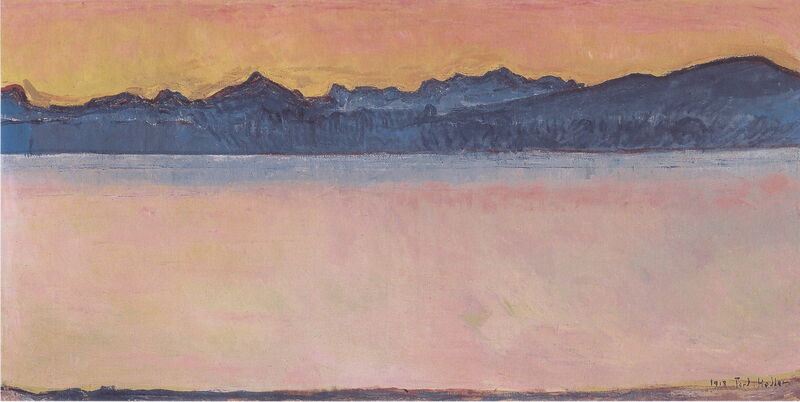 Lake Geneva with Mont Blanc in the (Red) Dawn Light (1918) is also simpler in its structure, with the water coloured by the sky, a zone of blue reflections of the far bank, the merged distant shore and mountains, and the sky. 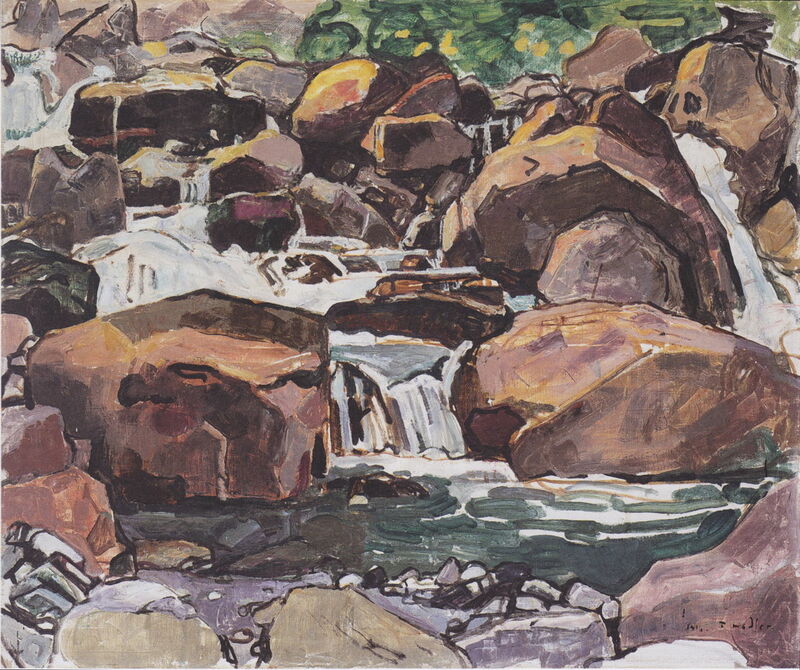 In Hodler’s ultimate and most sublime landscapes, he has eliminated the unnecessary detail, stating just the elements of water, earth, air, and the fire of the rising sun, in their natural rhythm. 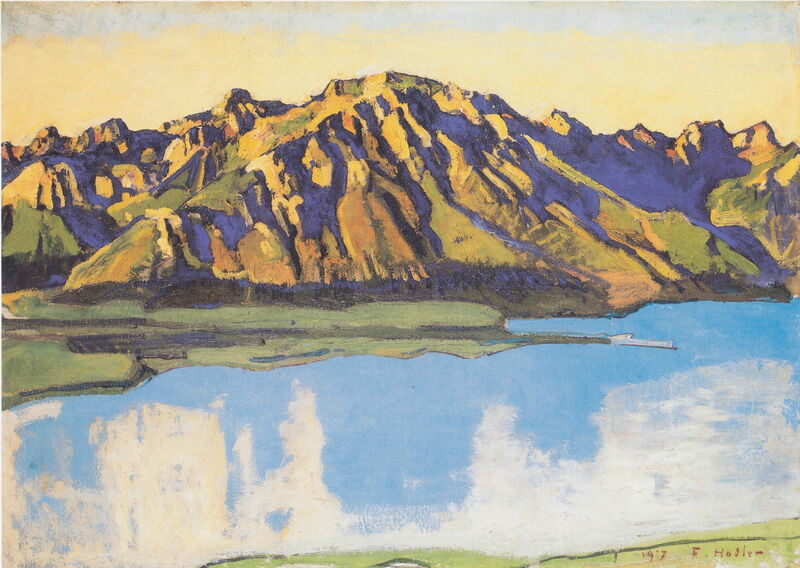 On 19 May 1918, Hodler died in Geneva, at the age of 65. He had painted around 600 landscapes.